Zakir Khan at his home in Nuh district in Haryana. Khan says he was attacked by cow vigilantes while legally transporting cows. Police claim he was smuggling cows and tried to attack them. For victims, seeking justice after a hate crime can be traumatic. Alwar, Banswara, Jaipur, Nuh, Pratapgarh, Rajsamand, Tonk: In September 2018, Irshad Khan was on his way to the district court in Behror in Alwar district, when masked men in a car without a number-plate approached his vehicle and fired in the air. Irshad was on his way to testify in the murder trial of his father, Pehlu Khan, who had been attacked in April 2017 by a group of cow vigilantes while transporting cows from a cattle fair in Jaipur. Irshad filed an FIR (first information report with the police), but the police said there was no CCTV evidence of the alleged attack. Rajasthan accounts for 5.7% of the Indian population, and 25 of the 282 cases (8.9%) recorded in Hate Crime Watch, a database of religious identity-based hate crimes across India from 2009 to 2019, maintained by FactChecker. It is the largest state by area, and has recorded the second highest number of hate crimes in the country since 2009. Across Rajasthan, survivors and their families alleged a range of hindrances in their journey seeking justice: police apathy, closed investigations, weakened cases, political influence, threatened witnesses, and a vitiated trial atmosphere. FactChecker has copies of 13 of the 14 FIRs (first information report, filed at a police station by anyone who has knowledge of a crime, including the police) and most chargesheets (filed in court by the police), where filed. “No one will accompany us to Behror. They say, who will go there to die?” Irshad told FactChecker, explaining why he is seeking a transfer of the murder trial outside Behror where the accused live and where the incident happened, to Alwar or elsewhere, where he thinks the trial stands a fair chance. Irshad said certain sections of the police were no different from gau rakshaks, or Hindu right-wing cow vigilantes. In his October 2018 application to the Alwar court, he pointed out that despite NDTV’s hidden-camera footage of an accused, Vipin Yadav, boasting that he had killed Pehlu Khan, the police had not moved to cancel his bail, though in an earlier statement they had said they would. Yadav denied making any such statements and contested his involvement in the offence when approached by FactChecker. In a similar case, lynching victim Umar Khan’s family said his son Maqsood was threatened some months ago. “He went on the court date and seven or eight people attacked him,” said Razzak Khan, his uncle. The case dates back to November 2017, when Umar Khan from Ghatmeeka village on the state border was killed in Alwar district on the suspicion of being a cow smuggler. Eight men from Marakpur and the neighbouring Gahankar village in Ramgarh tehsil, both in Alwar district, were arrested and charged. 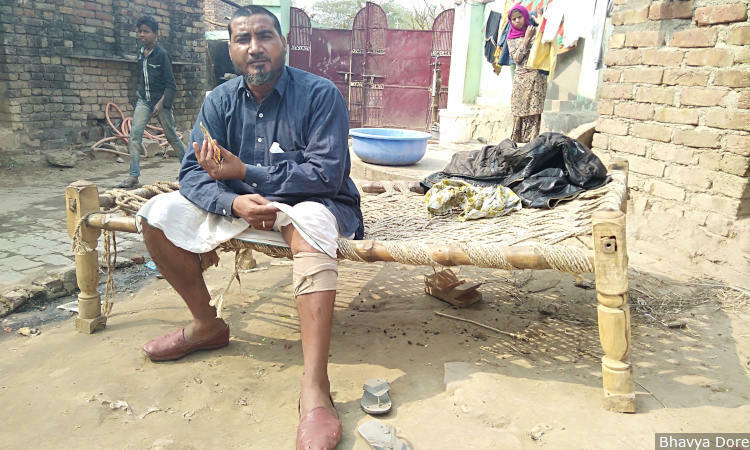 In another case involving an alleged cow smuggler, Rakbar Khan was attacked by cow vigilantes in Lalawandi village in Alwar district in July 2018, and was taken into police custody the same night. By the time he was taken to hospital, however, he was dead. Rakbar Khan’s father Suleman, and Aslam, a companion from the night of the attack, have moved the Supreme Court seeking a transfer of the investigation to the Central Bureau of Investigation (CBI), India’s foremost federal investigative agency, and transfer of the trial from Rajasthan to Delhi. They have also sought protection for Rakbar’s family and for Aslam, an eyewitness who survived the attack. There is also an allegation Aslam was threatened. “[T]he police came and took him to Alwar, Rajasthan [from his home in Mewat], for recording his statement. There, he was threatened and intimidated in order to make him change the statement earlier given. But despite threats, he stuck to his version,” the petition submitted in the Supreme Court said. The witnesses are “under tremendous pressure”, Mehmood Pracha, their lawyer representing the case in the Supreme Court, told FactChecker. Pracha wrote to a newly appointed director general of police of Rajasthan in January 2019, seeking a free and fair investigation and emphasising there was “overwhelming evidence” pointing to Ahuja’s role, but “owing to his political clout no action is being taken against him”. Speaking to FactChecker, Ahuja denied allegations of wrongdoing in this case and said he was simply against smuggling and pro-cow protection. Further south in Rajsamand, where the trial of Shambhu Lal Regar has begun, the victim’s family has petitioned the Supreme Court to transfer the case to Malda district in West Bengal where they live. That crime was recorded in all its grisly, pixelated detail, as Regar hacked Afrazul Khan, a Muslim, Bengali labour contractor, to death on camera. In her plea, Afrazul Khan’s wife Gulbahar Bibi sought an independent enquiry by a central agency and the appointment of a special public prosecutor. The petition said the atmosphere in Rajsamand had been polarised and vitiated in support of the accused and that she “… does not have any confidence in the local police to make such an elaborate detailed investigation, especially when the local police itself is under pressure from violent outfits”. Bibi also asked that the video of the killing, still available online, be removed. Questions have been raised about the role of the police in each of the lynching cases. When the police lodged an FIR against the mob that attacked Pehlu Khan and his sons, they chose Section 308 (attempt to culpable homicide) of the Indian Penal Code, rather than Section 307 (attempt to murder), which activists called a dilution. Section 302 was added to the chargesheet after his death. A report, ‘How the police are protecting the murderers of Pehlu Khan’, supported by a consortium of civil society groups, noted multiple discrepancies or gaps including: contradictory timings in the FIR, the omission of penal sections relating to armed rioting, conspiracy and common intent; and the failure to arrest certain accused persons. “We saw them detaining a whole lot of people but later they said they only got hold of three people,” said Irshad. Pehlu Khan died in hospital, after giving an oral statement (which eventually became a ‘dying declaration’) that the police noted down, naming six of the men who assaulted him. However, that declaration was not signed by the doctor on duty, weakening its value as admissible evidence. The six men he accused were exonerated following a report by the CID–the federal Criminal Investigation Department–saying they were not present at the scene of the crime, in contradiction of Irshad’s claims. This episode was detailed in this September 2018 report in The Wire. “Throughout our interaction and investigation there we found the investigators had been trying to get evidence in favour of the accused and not in support of the victim,” said P.V. Surendranath, a Supreme Court senior advocate and member of the fact-finding team from Bhumi Adhikar Andolan (BAA), a collective of NGOs. BAA published the report ‘Divide and Rule in the Name of the Cow’ looking into various lynching cases. “They painstakingly took the investigation on a tangent to find evidence in favour of the accused,” he said. Umar Khan was shot while transporting cows through Alwar district to Ghatmeeka village on the Rajasthan-Haryana border, according to the chargesheet. FactChecker spoke to the police and villagers in Marakpur, near where he was shot at; the latter claimed he was a smuggler who attacked them first, though his companion Javed Khan, who survived, denied this. Umar Khan’s body was found on nearby train tracks later, and the police arrested eight men from Marakpur and the neighbouring Gahankar village. The BAA report flagged a number of issues–for instance, it said the FIR was lodged two days after the body was found and “only after the relative specifically lodg[ed] a complaint”. Further, “despite the fact that the offence of murder was carried out by the members of an unlawful assembly with the intention to kill and by carrying, possessing and using dangerous weapons and means, the police have not added [the relevant sections] of IPC while registering the FIR”, the report said. Umar’s local lawyer Kassim Khan said the eight men who were arrested and charged all got bail within a few months. “So somewhere there have been weaknesses in the prosecution’s case,” he told FactChecker. In the case of Rakbar Khan, who was detained by villagers and arrested by the police, the police first made arrangements for the confiscated cows to be taken to a gaushala, or cow shelter, before taking an injured Khan to hospital. They even stopped for tea on the way–as per the chargesheet. Khan died by the time they reached hospital. Later, one assistant sub-inspector, Mohan Singh, was suspended. “That was police negligence,” Kassim Khan, an advocate looking at his case, told FactChecker. Villagers said the three men charged for murder did not beat him, and that he died from police torture. The police rubbished these claims, saying Khan’s condition seemed alright, and there was no deliberate delay in taking him to hospital. Victims in each of the four Alwar lynching cases have also been booked or charged under the Rajasthan Bovine Animal Act for smuggling cows. Each of the lynching cases took place at night, lending credence to the suspicion that these men were engaging in an illegal activity. Those booked for smuggling say the cases are false, aimed at harassing them and affecting their livelihood. Pehlu Khan’s son Irshad has submitted documents from the Jaipur cattle fair to show their cows had been purchased legally for Rs 75,000. In the case of Rakbar Khan, Naugaon police pointed to an old smuggling case from 2014, whose FIR said he and another man were caught taking two cows by foot across the border with Haryana for slaughter. They were subsequently charged for smuggling. Akbar Khan, Rakbar’s brother-in-law, said that was a false case. “The police asked for Rs 30,000 but he could not pay that much so they filed a false case against him,” he said. He claimed that this was a police racket and that they demanded money to let him go through the area even though he was not smuggling cows. Akbar said since he could not pay, they filed the false case. Umar Khan’s companions were booked and later charged with smuggling on the night of the attack, before Umar’s body was recovered. Villagers said the route was known for smuggling, and that the men had fired at them first. Javed Khan, Umar’s companion, denied wrongdoing and claimed the papers they were carrying were destroyed during the attack. In Umar’s village, Ghatmeeka, residents said they have been maligned by the police as smugglers. “Prejudice and clear bias and religious profiling have led to numerous false cases being filed against dairy farmers as cow smugglers and causing systematic harassment,” the BAA report on lynchings said. In the fourth lynching case, Zakir Khan from Uttawar village in Nuh district was booked by the police for cattle smuggling in December 2017, arrested and taken to hospital, while the eight cows in his tempo were confiscated by the police, according to the chargesheet. Police claimed he had tried to attack them when they stopped his vehicle, and also charged him with attempt to murder. When FactChecker met Zakir, he denied attacking the police, saying they were not even present at the scene until much later and that gau rakshaks had attacked him and destroyed papers that proved he was not smuggling the cattle. In some cases, the police did not file a case despite allegations of violence. Similarly, in Salpura village near Alwar city, where Suresh Chand, a pastor, was reportedly beaten up and threatened on suspicion of forcibly converting locals, the police did not file a case. Both Chand and the alleged aggressors who called the police were sent away from the police station. Chand told FactChecker the police discouraged him from pursuing a case. In some cases recorded in Hate Crime Watch, the FIRs lodged by the victims were closed and no one was charged, either because no accused persons were found or no evidence was found against the accused. In a second case where the FIR was closed, the alleged assailant was known. In Jaipur when Sadhvi Kamal Didi, a local Hindu leader, lodged an FIR against the owner of Rabbani hotel on suspicion of cooking beef, a crowd gathered to protest outside the hotel. The owner, Naeem Rabbani, filed an FIR in response, alleging that two of his employees had been beaten up and people had forced entry into the property. Sadhvi Kamal Didi, the Hindu leader, said there was no violence. The police closed both FIRs without filing a chargesheet in either. No chargesheet has been filed yet against the alleged Hindu or Muslim perpetrators in the communal clash that broke out in Tonk in March 2018, the local police told FactChecker. In Bagpura village in Rajsamand district, police closed the only two FIRs filed–one in which the victim was Hindu and another in which the victim was Muslim–for destruction of property. In Tonk city, the police said they did not have the legal authority to investigate the then-state legislator Ajit Singh Mehta and member of parliament Sukhbir Singh Jaunapuria, both from the BJP, who led a procession that sparked violence when an unidentified person threw stones at the Shahi Jama Masjid. In this case, Muslims across the locality praised the role of the police and their promptness in preventing matters from escalating. But in Pratapgarh, tribal Christians claimed that the police watched silently as members of right-wing Hindu groups laid siege to their Christmas Day event in December 2017 and terrorised guests. The alleged attackers have denied there was violence. The police took two days to lodge an FIR. Sunny Maida, a pastor, said the police were more interested in questioning the guests. “They asked people, why did you come here, why are you attending this programme, don’t you get food at home?” he said. In one case, members of a Muslim family in Tonk were booked for attempting to attack police personnel on duty in March 2018. The police FIR said they had come to seek out one Imran at his home at 6.30 am, suspecting him of having been part of a communal clash in Tonk city two days earlier, but were abused and assaulted. However, the family lodged an FIR against the station house officer (head of the local police station), Ashok Meena, claiming his team had strong-armed their way through, hit women and broken property. Two family members were taken to hospital, as also a policewoman, according to the FIRs. “You are searching for people, that is fine, but do you have the authority to harass them and assault women?” asked Yasmin Farooqui, an activist and member of the All India Muslim Personal Law Board (AIMPLB), considered a representative voice for Muslim opinion in India, that helped file an FIR against the police. Meena said the police were prevented from doing their job when the family began fighting with them. He said there was no partisan action, that both Hindus and Muslims were arrested and questioned. Minorities and activists that FactChecker spoke to said in general, their experience of police action had shown bias. “The police do try and do their work but definitely they are under pressure from Hindu groups,” said Farooqui, the AIMPLB activist. This concludes our series investigating 14 hate crimes across Rajasthan. You can read the first part here, the second here and the third here. The previous, six-part series reported from Uttar Pradesh can be read here.